A jerkbait imitates a large baitfish in distress, diving below the surface, then floating back up or darting erratically from side to side. The term jerkbait results from the sharp, jerky retrieve needed to give the plug its action. Jerkbaits have practically no action with a steady retrieve. 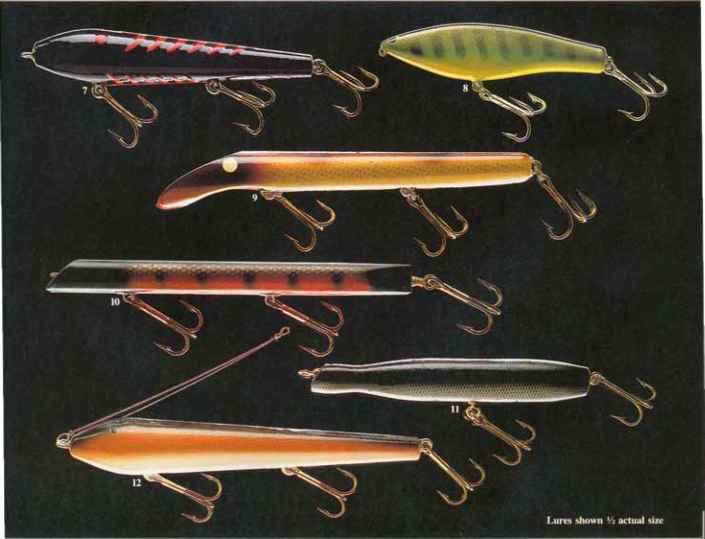 Nearly all jerkbaits are made of wood. They fall into two categories: high-buoyancy models, most of which have a metal tail to make them dive; and low-buoyancy models, which do not have tails. High-buoyancy models stop quickly after being jerked, then rise rapidly to the surface. Low-buoyancy models have more side-to-side action, glide forward after the jerk, and rise to the surface more slowly. Most jerkbaits dive from 2 to 4 feet, although some go as deep as 8 feet. 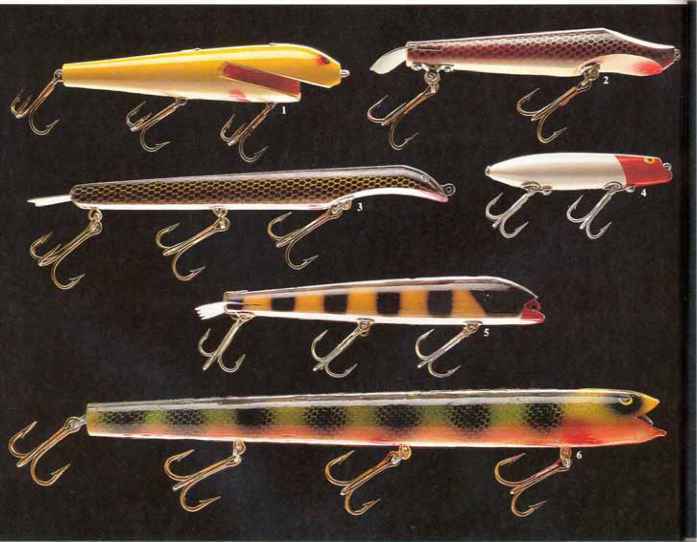 Because the density of wood varies greatly, one jerkbait may dive or glide differently than another of the same model. Jerkbaits will catch fish throughout most of the open-water season. If the water temperature is below 60 F, use a low-buoyancy jerkbait and work it slowly. In warmer water, use either style of jerkbait and work it more rapidly. When you give a jerkbait a sharp pull, it displaces a large volume of water as it darts ahead. 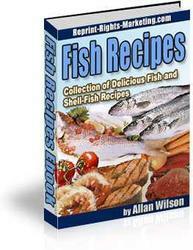 Fish sense the sound and vibration, so they will strike jerkbaits in either clear or murky water. 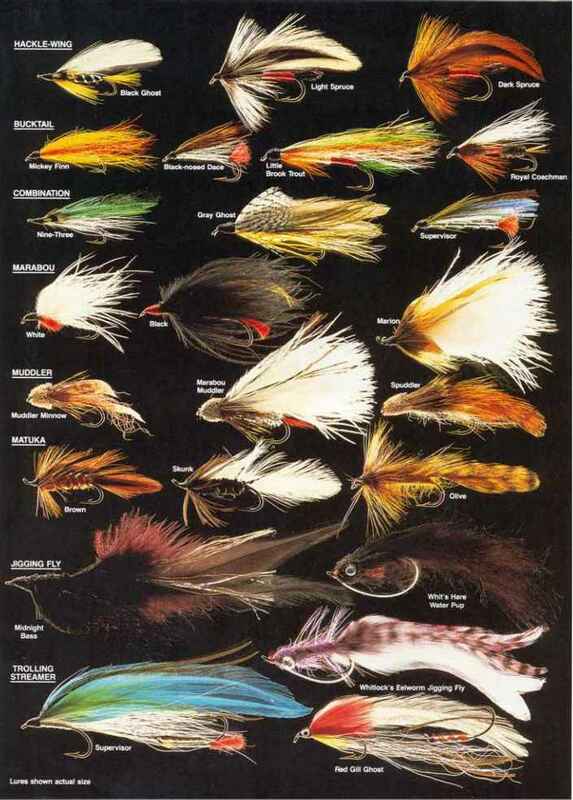 JERKBAITS include (top) high-buoyancy models which which usually have internal lead weights and no tails. have a fluke-like metal tail and/or a grooved head to make Most jerkbaits have an attachment eye near the tip of them dive, and (bottom) low-buoyancy models the nose and 2 or 3 extra-strong treble hooks. Hat Shiner; (9) The Stalker tm, which has a scooped- Neek; (12) Eig Jerk (Teddie's Eait). TEST the flotation of your plug after attaching the sinkers by placing it in a tub of water. 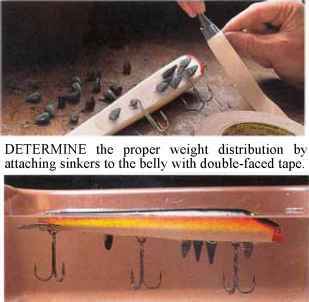 Continue taping sinkers in different positions until the plug floats level with its back barely out of the water. Many experts rate jerkbaits as the number-one lure for muskies and big pike. 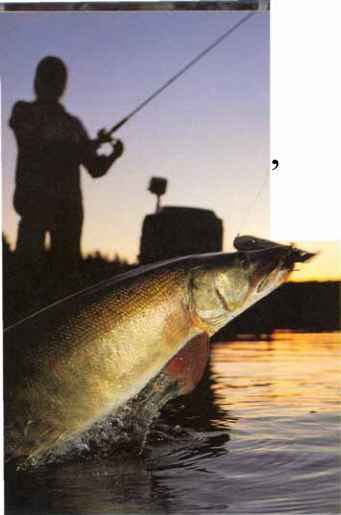 Although seldom used for other fish, jerkbaits sometimes take trophy-class walleyes and largemouth bass by accident. You can rip a jerkbait through sparse weeds, retrieve it over weed tops or work it near a dropoff. After casting, reel up enough line so that the plug points straight toward you. Continue reeling while making sharp sweeps that can vary from 6 to 36 inches in length. DRILL holes exactly where the sinkers were attached. If using cone sinkers, drill a small hole for the nose, then drill out the top of the hole for the base. Partially fill the holes with epoxy, seat the sinkers, then seal. A high-buoyancy jerkbait rises quickly, so you must retrieve with closely-spaced jerks to keep it from floating to the surface. Most fishermen find they can jerk more quickly with the rod tip pointing downward rather than sideways. When fished this way, these plugs dive rapidly, moving up and down more than side to side. A low-buoyancy jerkbait will not dive as steeply. Short, sharp jerks will give it a side-to-side action; long, smooth jerks will give it_an up and down, gliding action. Because the plug glides farther with each jerk and does not rise as quickly, the jerks can be more widely spaced. Ideally, the plug should follow a zigzag path 2 to 3 feet wide. Experiment with the length and timing of your jerks to find the pattern that works best. Often a series of 2- to 3-inch tugs between longer jerks with rigger the fish to strike. Casting is by far the most popular method for presenting jerkbaits, but trolling can also be effective. Motor along the edge of a weedbed while sweeping your rod sideways. Adjust your trolling speed to suit the action of the plug. Some fishermen doctor their jerkbaits, especially high-buoyancy models, to make them run deeper, glide farther, and float back to the surface more slowly. A doctored plug with often draw strikes from fish that ignore standard models. And you do not have to jerk as frantically to keep the plug from rising to the surface. Setting the hook with a jerkbait is more difficult than with other plugs. Slack forms after each jerk, and unless you reel up the loose line immediately, you will not be able to get enough leverage. Even if your line is tight, you may have difficulty. When a big pike or muskie clamps onto your jerkbait, only an extremely strong pull with break the fish's grip and move the plug far enough to sink the hooks. To set the hook this hard, you need a very stiff rod. Jerkbaits may weigh as much as 4 ounces, so a stiff rod is also necessary for casting and retrieving them properly. A rod with a long handle provides extra leverage for casting and setting the hook. Most fishermen use 30- to 50-pound dacron line on a sturdy, free-spool reel. Dacron line will not stretch and cause you to lose hook-setting power. If your jerkbait comes with a leader attached, additional snaps or leaders are unnecessary. If it does not have a leader, attach a solid-wire or multi-strand wire leader of at least 45-pound test. A common mistake in fishing with jerkbaits is horsing the fish after you set the hook. With a stiff rod and heavy, non-stretch line, you can easily rip the hook loose unless you play the fish carefully. BEND the metal tail down slightly to make the plug dive more sharply. Bend one side of the tail down to make the plug veer more to that side. PLACE a strip of fluorescent tape on the back of your jerkbait. The tape helps you see the plug in the water so you can control its action. How to build a jerkbait? How to attach tail to jerkbaits? How to make a jerkbait? How to make a jerkbait with tail? How to make jerkbait lures? Do i need leaders for jerkbaits? How to build Suick Jerk Bait? 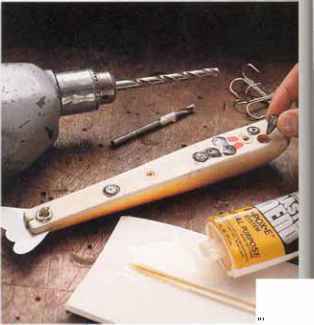 How to make your own wooden pike lures and plugs?